Alfa Romeo says its 4C sports car won’t disappoint and, with the brand’s hopes for a successful return to the United States riding on this sleek two-seater, it had better not. The production 4C is expected at the 2013 Geneva Motor Show in March, and since the show is just over three months away, it’s time to start teasing. Aside from a few 8C Competizione sports cars that may have slipped through the net, the 4C will be the first Alfa Romeo officially sold in the U.S. since 1995. The 4C, a mid-engined sports car with classic Alfa style, debuted as a concept car at the 2011 Geneva show. So far we can tell that the production version, expected in the U.S. as a 2014 model, will have similar wheels to the 2011 concept. There was little about the 4C concept that needed changing, certainly not its Italian Lotus Exige looks. However, some of the concept’s carbon fiber may be replaced with cheaper materials to lower the price. The 4C will, after all, be competing against the Exige and Porsche Cayman, not anything from Ferrari (Alfa Romeo’s corporate sibling). Hopefully Alfa will be able to preserve the concept’s low curb weight. The 4C concept was powered by a 1.8-liter, turbocharged four-cylinder engine with 300 horsepower. It’s 0 to 60 mph time was 4.5 seconds. We’ll have to wait for the production 4C’s debut to see if any changes have been made under the bonnet. The 4C could not only anchor Alfa’s return to the U.S., it could also mark an exciting change of direction for the brand. Right now, Alfa only builds the MiTo and Giulietta (basis for the Dodge Dart) hatchbacks, but it could be on its way to becoming an Italian Porsche. In addition to the 4C, Alfa is working on a new version of its iconic Spider, the car Dustin Hoffman made famous in The Graduate. It’s being co-developed with Mazda, and the platform will also underpin the next Miata. On top of that, Alfa recently showed another sports car concept, the 6C Cuore Sportivo. Of course, all of these plans could fall through, just like Alfa’s many attempts to return to the U.S. since its 1995 departure. 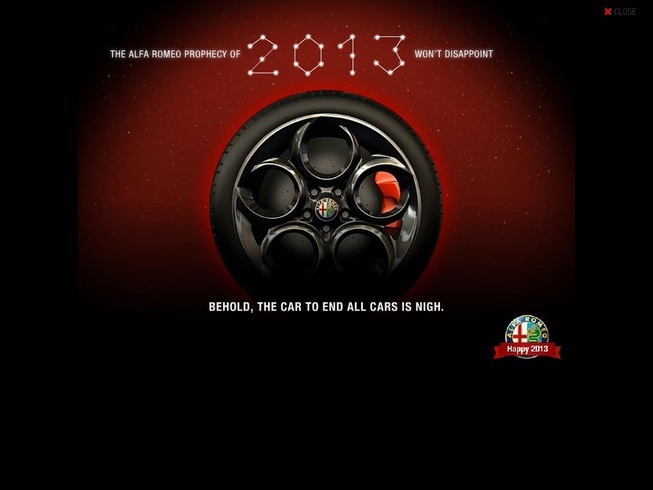 Despite the 4C teaser’s tagline, reports of the brand’s return have been less reliable than Mayan Apocalypse prophecies. Alfa even pitched an SUV, called the Kamal, in 2003, to generate interest. The 4C is a much more exciting car than any SUV, so hopefully we’ll be seeing it soon.